Bill and Ellen Painter have been avid cyclists for the past 3 decades. Over the years, the two have participated in many competitive events ranging in length. One of their favorites is the annual MS150. To date, Bill (59) has completed this important event that raises funds for Multiple Sclerosis (MS) research and programs 24 times. He and Ellen are members of a cycling team the “Grateful Tread” that has collectively raised more than 1/2 million dollars for the MS Society. Bill’s long term goal has been to finish the MS 150 event 25 times. Unfortunately, over the past several years, Bill has experienced a progressive loss of his sight leaving him legally blind. He has also had to overcome a series of other medical problems that have caused a temporary setback in his plans to ride. The Sunday before Thanksgiving, back in November of 2013, was the last time Bill was able to ride his high performance bicycle. Wanting to get back in the saddle again, Bill knew he would require an adaptive cycle if he was going to be able to ride again. Race forward to the Summer of 2017, Bill and his wife Ellen reached out to Mark Andrews, Founder/Executive Director of Therapeutic Adventures – IndependencePlus Adaptive Sports (TA/I~AS), a Charlottesville based non-profit 501(c)(3) charitable education organization that provides adaptive sports and adaptive outdoor adventures for persons with disabilities and other special health needs. Andrews and board member Ciara Campbell, who is an adaptive athlete and avid hand-cyclist, met with the couple to explore adaptive equipment needs. 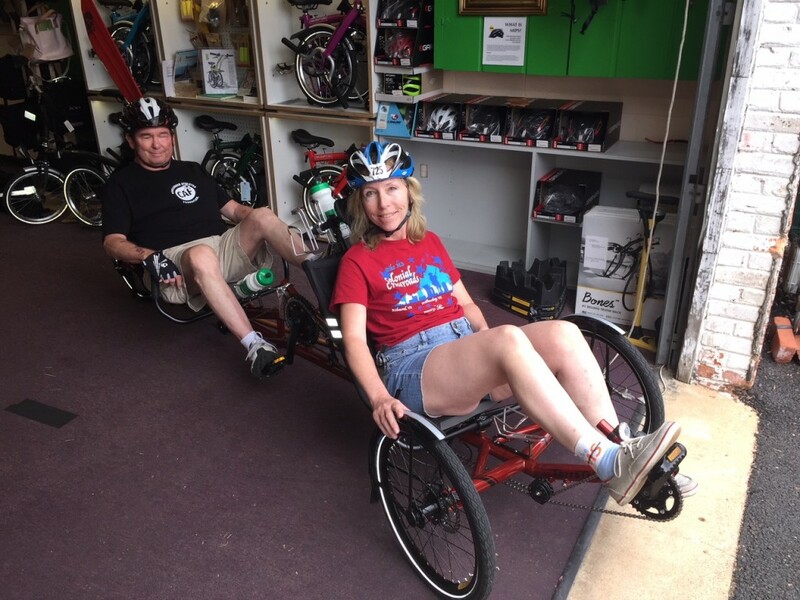 Assessment, exploration of adaptive equipment options, and some other consulting helped the couple to put a plan into action to secure funding for a special tandem recumbent tricycle. A special equipment grant from the national Challenged Athletes Foundation made it possible for Bill and Ellen to get the cycle that would meet their needs. After rehabilitation, lots of hard work and steadfast commitment to achieve his goal, the couple is ready to set the wheels in motion and ride together like they have done so many times before. According to Andrews, “We are so excited that the couple will once again be riding together in Bill’s 25th MS150 on Saturday June 2nd and Sunday, 3rd. We are equally pleased that Bill and Ellen celebrated 35 years of marriage two weekends before the race. Congratulations!